so they turned ultimately to biotechnology to replace the sentient robots. I'm sure they'd still use remotely controlled machines in environments that are too hostile for biologically derived machines. or ones with very simple intelligences. Yes they still used limited AI, but only as tools and not as "thinking" machines. i had acually forgot about that in Dune. But i was thinking more like The Maxtix for the uprising, but thought ti was stupid that they blocked out the sun because they could just launch solar satlites into orbit and tether down the power with space elevators or better yet just move to Mars or something. That's why i did a virus instead, which if good enough could kill them off enough so they could defeat them easily and still leave the River Tribe Technologically advanced y the next age so they can go explore the universe. Did they upload it to the Mothership with an Apple computer? Or they just cracked the mainframe with the aid of a robot traitor? Or Did the one rise? Or have I simply seen too many movies? That's a nice history you got there. You've woven it together neatly, and it makes sense too me. Here is you surprise huggkruka. (I was not sure if you had crops or not so i made field of those green leafy things you had on your food chart). 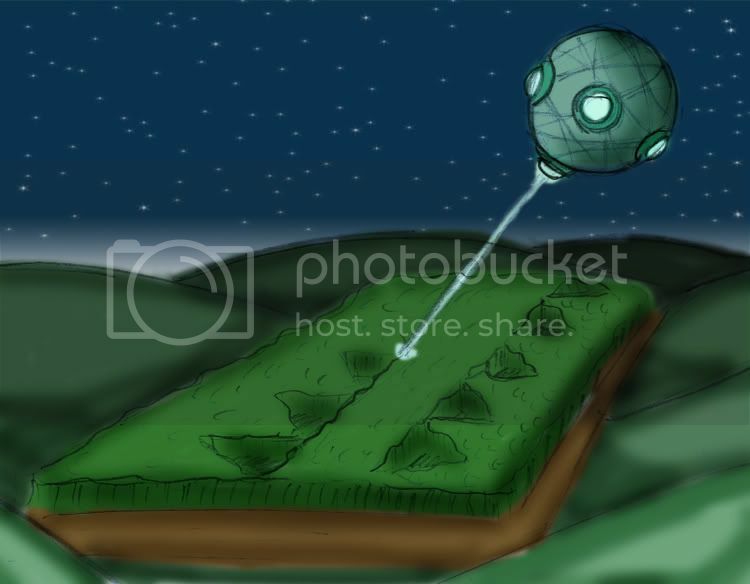 The Nauceans are taking samples of Kazean crops which leave their famous River Tribe symbol (the one thats on their poncho) of triangles in a line representing the river. However the Kazea do not know this and call them "Crop Triangles" thus bringing another piece to their UFO phenomenon. Is it just me, or have all the pictures disappeared? Dam it dam it dam it. Hydro you are possibly the best civ creator here. I am put to shame. I would create an article but i cant draw that good and my scanner is not working so mine would not be as interesting. I see you sporewikied this Hydro. http://www.sporewiki.com/Naucean all Very cool! I'll feel dissipointed if i never run into this creature. Here is a Prehistoric River Tribe Naucean chasing after a leptikdillo, a small hopping insectivore who are abundant in the river basin. As you can see this is before they used clothing or ornamental items. But unlike the Ocean tribe who is also naked these guys walk on land as well as swim in the river. It turns out they can run quite fast of their "fleet" and can grab prey such as the leptikdillo with its oral tentacles quite easily since it had so much of a reach as well as their necks. 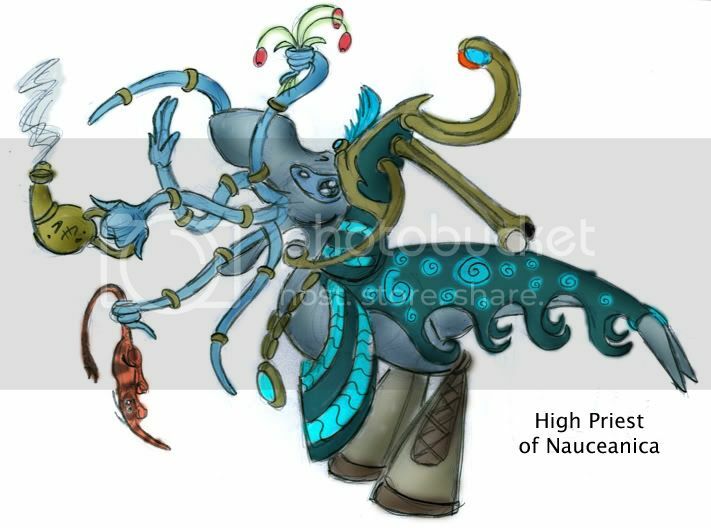 Here is the High Priest of the Goddess Nauceanica. She is the creator of all things and is why the planet is named after her. She holds out her 6 oral tentacles. Top right holds the home Red Dwarf Star, Au and in the other is the huge Super Giant Star in the neighboring soloar system. Both give their solar rays and give warms to the soloar system and the strange seasons. In each lower oral tentacles she hold s the 2 moon Serina and Sina. And in the middle oral tentacles she hold on the right darkness and all things evil and on the left light and all things good. She holds them out to separate them and keep the balance. Also on the headdress is the holy blue saphire stone with a blue feather which represent the air. The High Priest is holding red olivenuts which are used for healing, a dead leptikdillo which is an offering to the goddess, incense in a teapot-like object, and is adorned with many tentacles rings. On the neck poncho it has the holy symbol of the goddess which looks like a stream, as opposed to the River tribes poncho which looks lore like waves of the river. On the robe it has swirls which represent the stars and galaxies seen in the sky as well as the swirlling water. They believe that outer space is one big vast black ocean. And when they die they go to these stars in the afterlife ocean. Naucean temples are separate from the villages or cities and are usually in very rural areas which have a natural beauty about them. They all have complex ponds, fountains and waterways in which reperesent the goddess Nauceanica. There are many fresco paintings about the holy stories as well as many sculptures made of clay which is thought to be special in that it need water to create. The Swamp Tribe infact have an entire clay temple in honoring this magical property of clay. The high priests also believe they can look into the future my scrying into water. This method is known as "hydromancy" and works like an Oracle. Only the high priest can get visons and they believe these visions are from the goddess herself. Durring the Renaissance the river tribe built a gigantic hydromancy pool in which became one of the 8 wonders of the world. The Mountain tribe have ice temples and ices sculptures in which they use to depict the stories and they too believe that ice is a holy material just like mud and water and even steam. Also you can imagine hot springs are very holy places and usually become places for temples because of its special nature. This method is known as "hydromancy" and works like an Oracle. Only the high priest can get visons and they believe these visions are from the goddess herself. Durring the Renaissance the river tribe built a gigantic hydromancy pool in which became one of the 8 wonders of the world.